Pictured: Day One of the 2009 Global Green Challenge. Hot, hot, hot. That’s the only way to describe Day One of the 2009 Global Green Challenge, which set off from Darwin today (Saturday 24 October) in sweltering heat and humidity. First stop was Hidden Valley Raceway about 10km south of Darwin city centre. While the solar cars were put to the test on the track to decide the starting order for their event which starts tomorrow (Sunday), we only got as far as the pits, for scrutineering. All the production vehicles in the Eco Challenge were checked to make sure they had the appropriate safety equipment and were in good working order. Then our fuel tanks were brimmed at the BP nearby and the fuel flaps sealed with a self-voiding label. The field then had to drive back into the city. Some competitors didn’t realise that once the tanks were sealed, the Eco Challenge actually started as soon as we left the service station, rather than the starting ceremony in Darwin. There were a few red faces and disappointed people once they realised this. The 18 production cars competing in the Eco Challenge (which starts one day ahead of the Solar Car Race) left Darwin’s centre square from 12.30pm at two minute intervals. The HSV team was lucky; we drew starting place number three at the driver’s briefing the night before. Each team was asked to literally pull a raffle ticket out of a hat. HSV team member Rob Davis was the man with the lucky fingers. Car two on the road was the Ford Falcon XR6 Turbo and car four wasn’t a car. It was journalist and colleague James Stanford who is very bravely attempting this trek on a postie bike. He was wearing leathers under the white suit and a cape on the start line, but stripped off to more suitable attire once he left town. Being at the head of the field meant we encountered less traffic. All competitors, where practical, must keep apart and not drive in convoy. After 20km of nerve-wracking city driving (which had a few ambiguous route instructions just to keep us on our toes) we finally hit the open road, bound for our first stop at Katherine, about 320km south of Darwin. Normally this drive would take less than three hours because the speed limit on the open road is 130km/h. But the Eco Challenge cars typically averaged about 75km/h because the maximum travel time is 5 hours, otherwise penalties are added. We’re not aware of anyone exceeding the time limit as yet, but even as I write this late on Saturday night, it is hard to get results. All I know is how much fuel the cars around us used. The diesel powered Minis used between 12 and 14 litres per 100km. The petrol powered Suzuki Alto used about 14 litres per 100km. 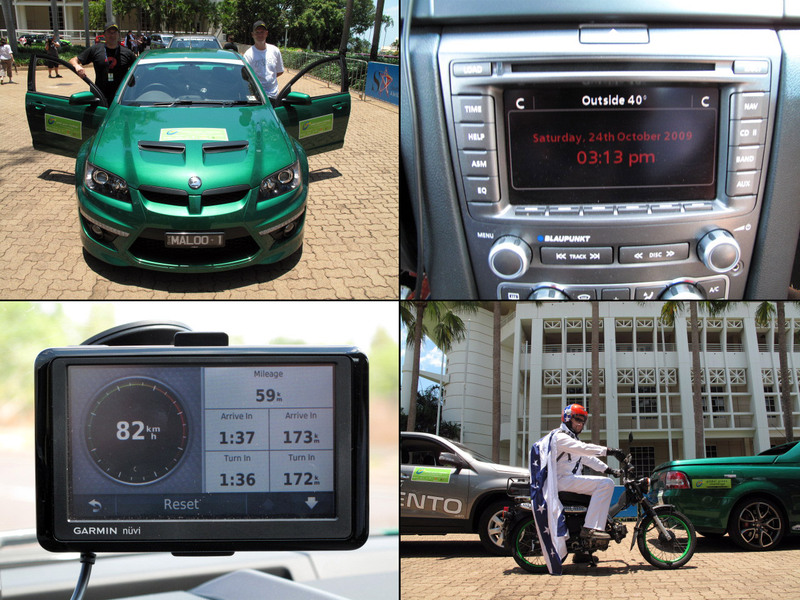 And our HSV Maloo ute used about 19 litres per 100km. The nearest performance car rival, the Ford Falcon XR6 Turbo sedan, took about 24 litres per 100km when the technical director refuelled each car in Katherine. We did an interview with ABC TV Darwin and it got a run on the nightly news. I told them that people think the only thing that’s green about our car is the paint job, but I pointed out that V8s are pretty economical on the open road. Especially if you drive the way we do, averaging between 60km/h and 75km/h depending on conditions. HSV engineer Gerry Becher and I are getting along well, especially considering the conditions were working in. To save fuel, we have switched the air-conditioning off, as most teams have. And with 38 to 40 degree temperatures outside, it get very hot very quickly. We reckon it’s about 45 degrees inside. We only met yesterday afternoon, so I guess we will know each other pretty well after spending the next six days, 10 hours a day, in the confines of a ute. We’re both into mountain bikes, so there’s plenty to talk about other than cars. Gerry drove today because he has more experience at driving a V8 in the city. We got caught out by a few red lights and some slow drivers, but it wasn’t too bad. At least we didn’t make a wrong turn, which would have cost us dearly. We are both taking in plenty of fluids (water and electrolytes) but we seem to sweat it out straight away. My black Popular Science T-shirt has salt swirls from how much salt my body is losing. We had the windows down about 1cm each for most of the day. But after closing the windows late in the day we think having the luxury of the windows down a fraction may have cost us some fuel, maybe 0.1L/100km. So we may tough it out with windows up from here on in. We passed the Tesla electric sports car as we left Darwin, within the first 20 minutes of the drive. That surprised us, as it left four minutes ahead. Later, we had a bit of a battle (not that you could really call it that) with the Falcon XR6 Turbo sedan. They left two minutes ahead of us, but we caught them at about two and a half hours into the drive. They were faster up hills and we were faster down hills. We swapped positions (and gave each other plenty of room, plus a friendly nod and a wave -- it’s amazing how much spare time you have at 60km/h) a couple of times before we eventually drifted apart. We ended up leading the (slow moving) field until about half an hour out of Katherine when one of the diesel Minis blasted past. Clearly one of the three Minis entered isn’t fussy about economy and just wanted to get there. It ended up taking 14 litres whereas the other Minis took on 12 litres. We took on about 19 litres and the XR6T took on about 24 litres. While our figure looks impressive, we aren’t getting too excited yet. For safety reasons, event organisers aren’t brimming each car until the last day. If each car is brimmed, the fear is that fuel could spill onto the very hot cars and possibly cause a fire. It will be much safer to brim all cars at the end of the last day when conditions are cooler. The results will still be accurate because cars that take in less fuel during the challenge will still need to take more on at the end. We face a bit of a nervous day tomorrow. It is one of the longest stages, travelling 669km from Katherine to Tennant Creek. We hope we have enough fuel to make it on one tank. Fingers crossed, wish us luck! The Tesla electric sportscar, the world’s quickest EV (it accelerates to 100km/h in 3.9 seconds and has a top speed of 200km/h) has been given special permission to drive on public roads for this event. 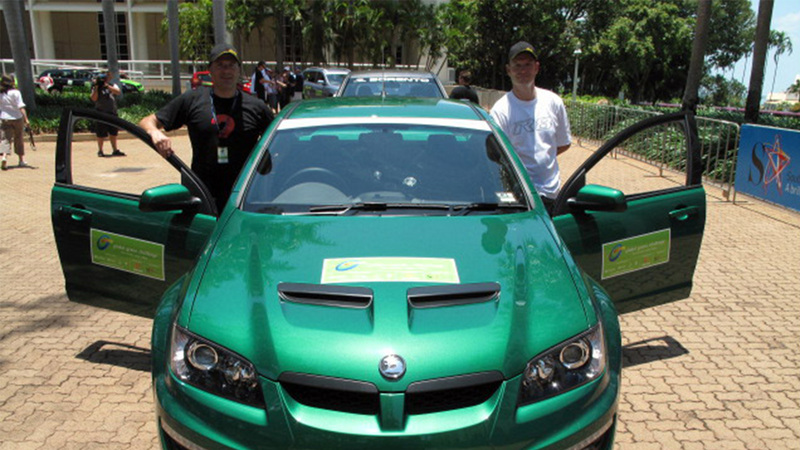 Driven by event sponsor Simon Hackett, founder of internet service provider Internode, it will lead the field each day. However there is some debate about the claim it won’t use a drop of fuel. The car itself won’t use a drop of fuel, but the truck following it with a generator (allowing it to be recharged along the route) does use quite a bit of fuel and emit quite a bit of C02. According to the truck driver, it is expected to use 700 litres of diesel driving from Darwin to Adelaide. The generator (which powers the fast charger, allowing the Tesla to be recharged in three and a half hours) uses between 5 and 10 litres of diesel in that time.